This year, Cisco unveiled the Catalyst 9000 family, shaping the new era of intent-based networking. The Network. Intuitive. The Cisco Catalyst 9000 Series switches are the next generation of enterprise-class switches built for security, Internet of Things (IoT), mobility, and cloud. The Cisco Catalyst 9000 Series switches come in three main varieties: The Catalyst 9300, the Catalyst 9400 and the Catalyst 9500. Here, the post will give an emphasis on Cisco Catalyst 9400 series switches and transceiver solution for them. 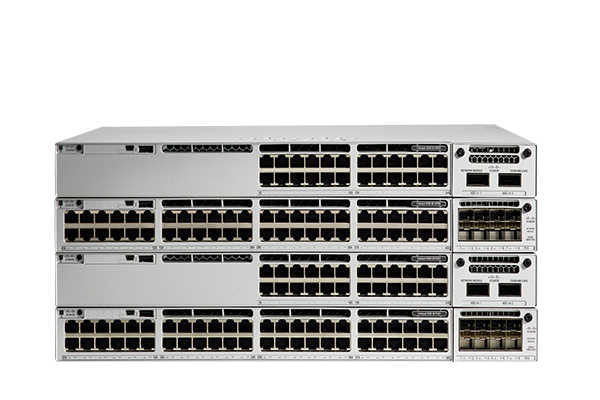 The Catalyst 9300 Series is the next generation of the industry’s most widely deployed stackable switching platform. Built for security, IoT, and the cloud, these network switches form the foundation for Cisco’s Software-Defined Access, the leading enterprise architecture. In addition, the Cisco Catalyst 9300-based models support a variety of uplink modules for both copper and fibre uplink support. These models add even more flexibility to the interface choices that you can make in a single Cisco Catalyst 9300 Switch or in a stack of Cisco Catalyst 9300 Switches. Digital disruption is changing how we think about our networks. Whether customers or employees, the “experience” has become a strategic imperative. The Cisco Catalyst 9300 Series fixed access switches are designed to help you change your network from a platform of connectivity to a platform of services. If you are in need of compatible optical transceivers for Catalyst 9300, give FS.COM a shot. FS.COM provides a wide range of supported optical transceivers for Cisco Catalyst 9300 series switch. Each one of them has been tested with assured 100% compatibility to them. This entry was posted in Fiber Optic Transceivers and tagged 100G, 10G, 25G, 40G, Cisco Catalyst 9300, optical transceiver on October 2, 2017 by Admin.